All of my soaps have the same chunky block shape which is a bit different than most of the other bars I've seen around - that's just the way I've always made them and it's become one of their distinguishing features. I think it's a comfortable shape to hold in one hand while you rub it on a washcloth or nylon bath puff, and if you really want a smaller bar you can always cut it in half. They are cut by hand and they weigh about 4.5 oz each. And did I mention that they last a really long time? 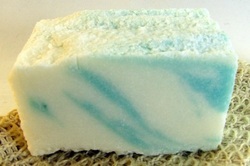 Please click on the mermaid to visit the "Soaps Men Like" page on my MysticWaterSoap.com website to see a variety of soaps preferred by my men customers, including a number of soaps that use the same fragrance as my shaving soaps. I make over 40 fragrances in cocoa butter bath soap, and about a dozen shea butter soaps, with some seasonal variation. Men's Sampler: Three guest-sized bars in scents that are most popular with men, individually wrapped and labeled and tied together with raffia. 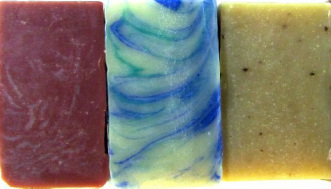 The soaps shown above are Sandalwood (a 20% shea butter soap), Irish Traveller, and Cedar & Sage (both cocoa butter bath soaps). Other combinations have included Eucalyptus & Spearmint, Marrakesh, Morning Mint, and Bay Rum - depending on availability. As of August 2017, the combination is Bay Rum, Marrakesh, and Irish Traveller: the first two are 20% shea butter soaps and the last is a cocoa butter soap. These are some of my best-selling soaps and are made with a large amount of sea salt. They can be used for both face and body. Check out all six kinds of salt soap here. When people ask if my soap is "all natural" I direct them to these soaps colored only with clay, honey, herbs and the oils themselves, and scented with plant essential oils. 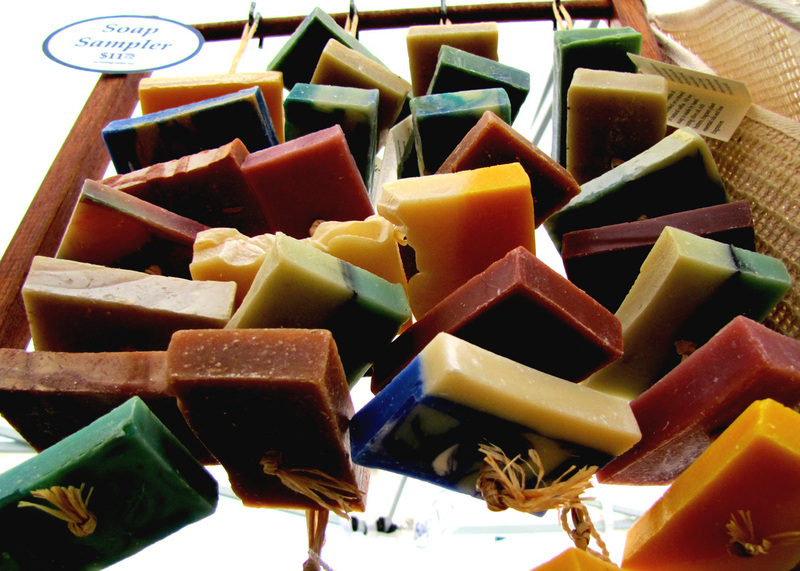 Differing amounts of superfat, different base oils and additives make these soaps ideal for both face and body. See them here. All of my soap is made naturally and "from scratch", by the traditional cold process method, but there are some desirable fragrances that can't be distilled or pressed from a plant. For these I use high-quality synthetics, without phthalates. Pretty in the bathroom, fragrant to hang in a closet, a welcome hostess or birthday gift, or simply as a way to try many different scents at once. Seven colorful guest-sized bars threaded on natural raffia.